To assess the profitability of a capital investment, companies can build a capital investment model in Excel to calculate key valuation metrics including the cash flowsCash FlowCash Flow (CF) is the increase or decrease in the amount of money a business, institution, or individual has. In finance, the term is used to describe the amount of cash (currency) that is generated or consumed in a given time period. There are many types of CF, net present value (NPV)Net Present Value (NPV)Net Present Value (NPV) is the value of all future cash flows (positive and negative) over the entire life of an investment discounted to the present. NPV analysis is a form of intrinsic valuation and is used extensively across finance and accounting for determining the value of a business, investment security,, internal rate of return (IRR)Internal Rate of Return (IRR)The Internal Rate of Return (IRR) is the discount rate that sets the net present value of an investment equal to zero. This guide to calculating IRR will give several examples and who why it's used in capital budgeting, private equity and other areas of finance and investing. If IRR is greater than cost of capital,, and payback periodPayback PeriodThe payback period shows how long it takes for a business to recoup its investment. This allows firms that may not have the ability to hold long-term. In this guide, we will outline the major line items that should be included in a capital investment model and how to use the calculated metrics to evaluate the investment. The first step to building a capital investment model is to determine the cash flows for the investment period. In this simplified model, we are presenting the income statement using the minimal number of line items – revenue, expenses, and profit. By subtracting the expenses from the annual revenue we can determine the profit for each year within the investment period, which will be used as cash inflows for the capital investment. The cash flow line will be the major input in the calculations of net present value (NPV) and internal rate of return (IRR) for this capital investment. We also need to determine the cumulative cash flow, which is essentially the sum of all cash flows from the beginning of investment period to present year. The cumulative cash flow figures will be used to compute the payback period of the investment. The net present value (NPV)Net Present Value (NPV)Net Present Value (NPV) is the value of all future cash flows (positive and negative) over the entire life of an investment discounted to the present. NPV analysis is a form of intrinsic valuation and is used extensively across finance and accounting for determining the value of a business, investment security, is the value of all future cash flows over the entire life of the capital investment discounted to the present. In this example, we will determine the NPV using three different discount ratesDiscount RateIn corporate finance, a discount rate is the rate of return used to discount future cash flows back to their present value. This rate is often a company’s – 10%, 15%, and 20%. This rate is often a company’s weighted average cost of capital (WACC)WACCWACC is a firm’s Weighted Average Cost of Capital and represents its blended cost of capital including equity and debt. The WACC formula is = (E/V x Re) + ((D/V x Rd) x (1-T)). This guide will provide an overview of what it is, why its used, how to calculate it, and also provides a downloadable WACC calculator, or the required rate of return investors expect to earn relative to the risk of the investment. In Excel, you can use the NPV function to find the present value of a series of future cash flows with equal time periods. The formula for the NPV function is: = NPV(rate, cash flows). In this example, the NPV of this capital investment would be $120,021 when the discount rate is 10%, $77,715 when discount rate is 15%, and $48,354 when discount rate is 20%. This tells us that when there is higher risk associated with a capital investment, investors expect to pay less today and expects a higher return in the future. The internal rate of return (IRR)Internal Rate of Return (IRR)The Internal Rate of Return (IRR) is the discount rate that sets the net present value of an investment equal to zero. This guide to calculating IRR will give several examples and who why it's used in capital budgeting, private equity and other areas of finance and investing. If IRR is greater than cost of capital, is the expected compound annual rate of return earned on a capital investment. IRR is usually compared to a company’s WACC to determine whether an investment is worthy or not. If the IRR is greater than or equal to the WACC, the company would accept the project as a good investment. Vice versa, the company would reject the investment if the IRR is less than the WACC. You can use the IRR function in Excel to compute the rate of return based on a series of future cash flows. The formula for the IRR function is: =IRR(rate, cash flows). The last metric to calculate for a capital investment is the payback periodPayback PeriodThe payback period shows how long it takes for a business to recoup its investment. This allows firms that may not have the ability to hold long-term, which is the total time it takes for a business to recoup its investment. Payback period is similar to a breakeven analysisBreakeven Number of UnitsThe breakeven number of units, as the name suggests, is the number of units of goods or services that a company needs to sell in order to break even, or in but instead of the number of units to cover fixed costs, it looks at the amount of time required to return the investment. A simple way to calculate the payback period is to count the number of periods until the company earns a positive cumulative cash flow on the investment. In the example provided, the company starts to have positive cumulative cash flow in year 5 and thus the payback period for this investment is 5 years. Beside calculating the payback period, a cash flow chart is also a good way to visualize the cash flow trend over the investment period and the time when the investment breaks even. 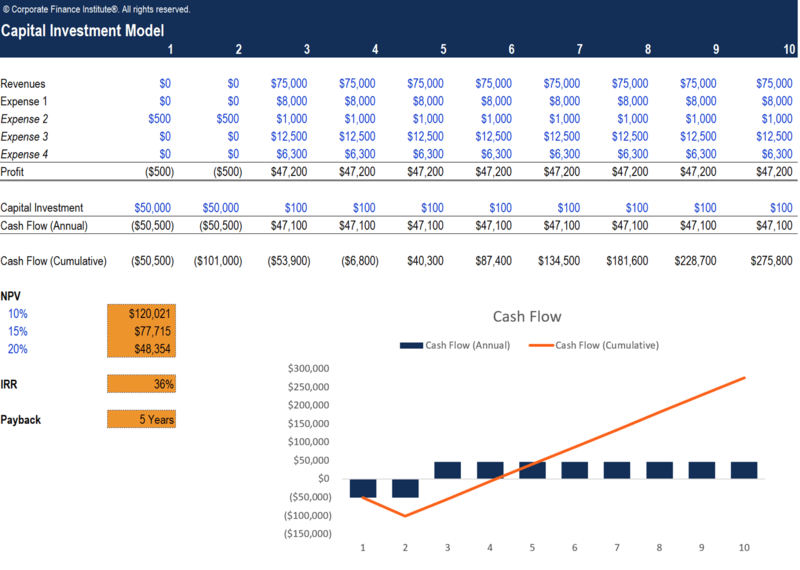 In the example above, the column chart in blue represents the annual cash flow of the investment while the line chart in orange shows the cumulative cash flow over the period. The point where the orange line intersects with the horizontal axis is the breakeven point, where the company earns zero cumulative cash flow and begins to recognize positive cash flow after paying back all initial investment. We hope this has been a helpful guide on what is a capital investment model and how to use it to evaluate the return on an investment. Return on invested capital (ROIC)ROICROIC) (Return on Invested Capital) is a profitability or performance ratio that aims to measure the percentage return that investors in a company are earning from their invested capital. The ratio shows how efficiently a company is using the investors' funds to generate income.